CDOT stands for Colorado Department of Transportation. This department has three primary goals: snow and ice operations, roadway maintenance and preservation, and construction management. The third goal is where we come in. 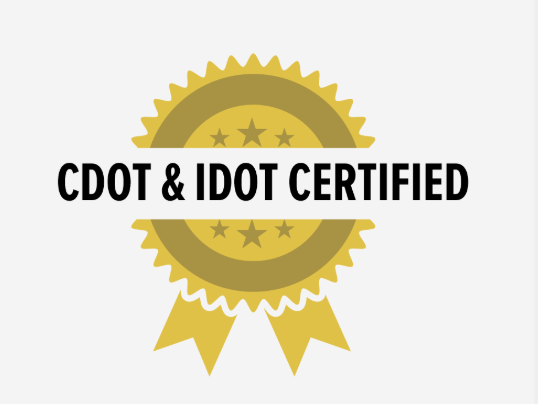 Businesses that have CDOT certification are authorized by Colorado legislature to work on CDOT construction, professional service, and research projects. With CDOT certification, we can work on authorized city of Colorado construction projects. Similarly to CDOT, IDOT stands for Illinois Department of Transportation. This department strives to ensure the safety, efficiency, and comfortability of all methods of transportation. Whether you’re in a car, train, or bus, IDOT wants to make your travel as easy as possible. In order to do this, they have a cycle: plan, program, design, implement, construct, maintain, operate, respond, repair, rebuild, innovate, repeat. IDOT wants to bring the 22nd Century’s methods of transportation into today’s world, and help create better transportation for tomorrow. So having IDOT certification means that we are qualified to work with IDOT on their projects. The Illinois Department of Transportation has tested our materials and determined that they are high-quality enough to be used for their projects. In order to receive IDOT certification, the department had to sample, and test our materials. Then they had to document and report their findings. This difficult testing process guarantees that IDOT uses only the highest-quality materials. We’re proud to say that ours have made the cut. Interested in learning more about Elston Materials? Feel free to contact us with any questions you may have or to request a quote.